In a 6-2 decision, the Supreme Court voted to protect pharmaceutical companies from liability when their vaccines cause debilitating injuries and death. The high court majority considers vaccines “unavoidably unsafe” and was worried about drug makers being sued and obligated to compensate their vaccine victims. Instead of opting to protect children, the Supreme Court chose to safeguard the financial interests of the multi-billion dollar vaccine industry. The ruling was a defeat for Hannah Bruesewitz, who suffered from a severe brain injury, developmental delays, and a lifelong seizure disorder after receiving a mandated DPT vaccine. She was denied compensation by the U.S. Court of Claims, which administers the federal Vaccine Injury Compensation Program. 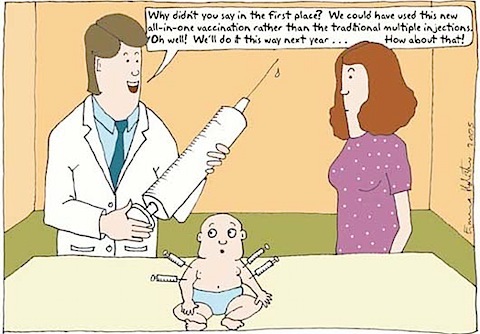 Established by Congress in 1986, this program was designed as a non-adversarial way for vaccine victims to be compensated for their injuries caused by compulsory vaccinations. However, during the past several years, this “non-adversarial” program has degenerated into a hostile and expensive legal battle for parents seeking restitution for their losses; nearly 4 out of every 5 cases are rejected. After being rejected by the U.S. Court of Claims (following several years of adversarial litigation), Hannah’s attorneys sued in civil court, providing evidence that the DPT vaccine manufacturer, Wyeth-Lederle, had the technology to produce a less reactive, purified pertussis vaccine but declined to do so. However, the Supreme Court has now declared that justice cannot be sought in American courtrooms. Listed below are links to blogs that reference this entry: US Supreme Court Immunizes Vaccine Makers Against Lawsuits. This is from a Supreme Court that says a corporation is a human being? Absolute corruption at the highest court these guys (men voted for this) should be fired for corruption. Vaccine makers protected by law from defective products, what other industry gets to injure the public and are protected by the government? This page contains a single entry by Toni published on February 25, 2011 6:45 PM. When ‘Medicine’ Makes Things Worse was the previous entry in this blog. AIDS: CD4 T-Cell Test is a Measure of Fat is the next entry in this blog.